The Under Secretary of the Navy is the second-highest ranking civilian official in the United States Department of the Navy. The Under Secretary, called the "Under" in Pentagon slang, reports to the Secretary of the Navy (SECNAV). William B. Franke April 17, 1957 June 7, 1959 Thomas S. Gates Jr.
R. James Woolsey Jr. March 9, 1977 December 7, 1979 Jimmy Carter W. Graham Claytor Jr.
^ "Official U.S. Navy web page". Archived from the original on July 24, 2006. Retrieved 2008-10-29. CS1 maint: BOT: original-url status unknown (link). 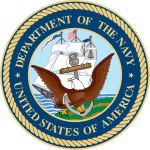 ^ "Navy.mil Leadership Biographies". America's Navy. Retrieved 2 November 2017. This page was last edited on 7 March 2019, at 13:26 (UTC).